Performance Art Oslo (PAO) is an artist-run initiative established in December 2012. 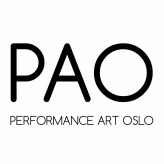 PAO is a member organisation for professional artists working within the field of performance art, living in Oslo / Østlandet, Norway. The organization aims to create a network and opportunities for performance artists through organizing seminars, workshops and international exchange, as well as creating a yearly international performance art festival, PAO Festival, the first of its kind in Oslo. In addition to working locally we collaborate with Performance Art Bergen (PAB) and other national and international organizations and groups who work within the field. We wish to convey performance art and promote the artists and their work. Board: Franzisca Siegrist (chair), Tanja Thorjussen, Inger-Reidun Olsen and Kirsty Kross. The board is responsible for PAOs administration and its artistic approach. Founding members: Franzisca Siegrist, Tanja Thorjussen, Inger Reidun Olsen, Tonje Lieberg, Martinka Bobrikova and Tone Gellein.